Disclaimer: This post contains affiliate links which means I may earn some commission if you purchase through my link without any additional cost to you. Read full disclosure here. As it is said achieving your goals is important and so is planning. Because without planning you don’t know how you are going to achieve your dreams. And the real work starts after planning. The real task is slaying the goals. As Nadalie Bardo says that achieving your goals means 20% planning and 80% slaying. For a successful life you need to have clear and specific goals. Clarity comes from introspecting your thoughts, what makes you happy and what moves you emotionally. 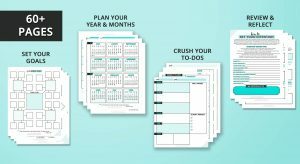 This is a printable planner and also form-fillable. And this is not a physical product. It is absolutely in a printable form. This planner really helps you in finding out about your goals. You might have heard a lot about goals but here Nadalie prompts to set your intentions. She says intentions are important than goals. Also you can print only those pages which you need. You don’t need to print the whole planner. The look is amazing . It has got that neutral look that men and women can equally use it for setting and accomplishing their goals. It starts with table of contents where you can choose which pages you will need to go on journey of accomplishing the goals. And you don’t need to print the whole planner , rather you can print only those pages that you really want. 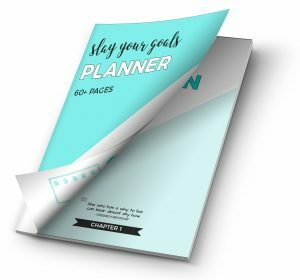 This planner triggers your thoughts to think about your mini as well as bigger goals. You start with your intentions and go on developing and planning your short term and long term goals. We all know how enthusiastically we start our goals and then the enthusiasm weens off , you start becoming lazy and then forget about your goals and dreams. Or they take a back seat. 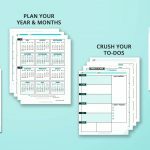 But this planner is designed the way that you can stick to your goals by planning them on yearly, monthly, quarterly , weekly and then daily basis. When you see your enthusiasm fading away, you need to sit and start reflecting on what is going wrong. what you are doing wrong that you are not reaching your goals. 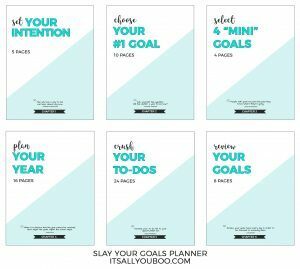 Slay your goals planner gives you a pathway to set your intentions and goals and slay them. 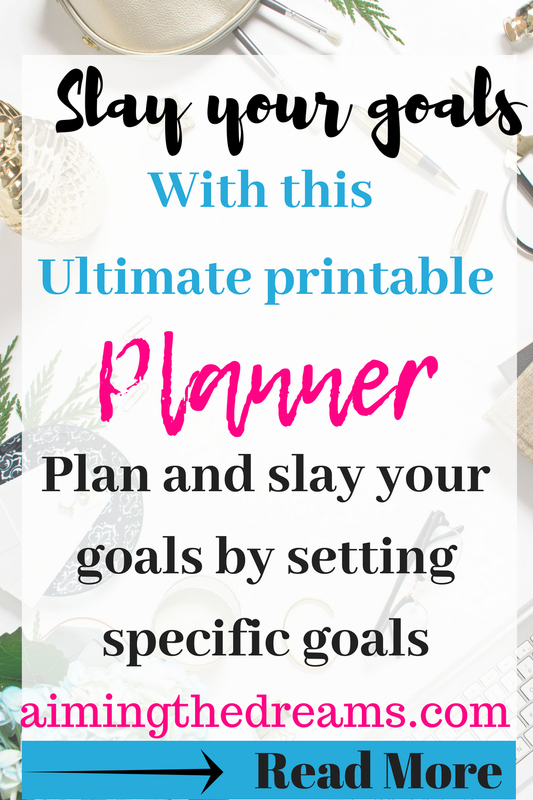 You know what I like about this planner is that it is not about setting and slaying financial or professional goals only, it is also for your health , relationships, educational as well as emotional goals. This is a whole package for setting your goals for most of the areas of your life. And the best part , you get to start your spiritual goals also. Connecting to something greater really helps you in bringing your own self near to you. And you actually start realizing what you want in life. What your happiness is. How you will create a pathway for fulfilled life. Bonus you will get lot of quotes to read. Nadalie always give lot of quotes to inspire. This beautiful slaying the goals planner gives idea about the S.M.A.R.T goals. Big goals and way to achieve them. What are S.M.A.R.T goals ? This means that your goals should be specific. You should know what you exactly want to achieve and why. Then how will come to you. Also goals should be measurable and achievable. When you pay attention to your goals, they should not seem scary. Rather you should have a sense of happiness. While using the planner, you will have a clear idea of what you need to do to achieve what you want.